NEW SPANCO WEBSITE IS LIVE! Spanco’s Newly Renovated Website Was Designed with YOU in Mind. The new Spanco website has been remodeled with a clean design and simple user-interface to improve communications and functionality. This new design aims to streamline the buying process and provide important information in a way that is clear-cut and accessible. The site is also optimized for mobile use, and Product pages now include bid specifications, design standards, and a variety of other reference materials for your convenience. Blog Posts Customized for YOUR Needs: Spanco makes a concerted effort to provide only relevant and useful content, which is a driving force in the development of the new Materials in Motion blog. With a wealth of information to pull from, we rely on customer feedback and frequently asked questions to deliver the information you’re looking for—without all the extra fluff. If there’s something you would like us to cover in the Materials in Motion blog, please feel free to contact us at marketing@spanco.com. Problem solving is a major factor that separates Spanco from the competition. We customize hundreds of unique solutions each year to meet the demands of some of the most complex material handling problems in the industry. Here is a list of four unique solutions developed by our highly skilled team of engineers and technical specialists. You might just be surprised to learn what we can do to improve your operation. Purchasing an overhead crane system is a long-term investment that can dramatically improve operations, streamline production, and increase worker safety. Selecting the best system for your operation will ultimately save you money in the future. Here, we have provided a full overview of important factors to consider when selecting the right overhead crane for your application and facility. This year’s CONEXPO show was one of the biggest expositions that the construction industry has ever seen. With so many industries under the umbrella of construction, it was important to showcase one of the most versatile pieces of equipment that we manufacture. 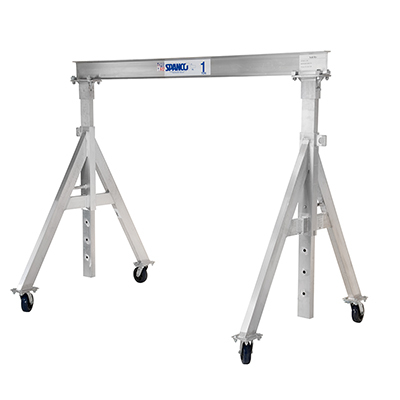 Our pre-engineered aluminum gantries provide the type of flexibility and portability necessary for most construction applications. While more than 200 of the show’s exhibitors were displaying products and services related to lifting equipment, Spanco, Inc. was the only overhead crane manufacturer present.